1. Are you able to pass by a plate of cookies and not take one or are you a bit of a 'Cookie Monster'? Goodness, no! I LOVE cookies, I am definitely a cookie monster! I would for sure stop and grab a cookie. 2. Tell us about your favorite cookie. Have your tastes changed since you were a kid? I love Snickerdoodles and chocolate chip...both homemade of course. 4. It is that time of year and they are selling them on every corner and in front of every store! Do you buy Girl Scout cookies and if you do, which is your favorite? I usually do buy Girl Scout cookies, but I did not this year. I like to try new ones, but Thin Mints cannot be beat. 5. Raw cookie dough. Yay or Nay? Yay, but I do not eat it anymore. I loved eating it when I was younger. 6. Please tell us something random about your week!! Today will be Wacky Wednesday at the preschool! Last Friday we celebrated Dr. Seuss's birthday and we will do something special to celebrate every Wednesday all month long on Wednesday. Today we plan to wear our Dr. Seuss shirts and some really huge crazy shoes over our tennis shoes. We are also going to spray our hair pink. My hair will be in pig tails too. It is a super fun day. I hope I can find some Oreos to give the kids too! Sounds like a fun day with the wacky Wednesday. 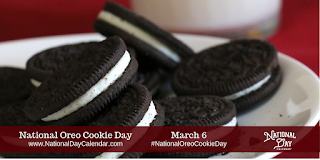 I did not know it was national Oreo day as I love Oreo's and they must be dunked in milk. Lori, you really need to post a photo of you with pink pigtails!! How FUN!! Thanks for joining the cookie Medley today!! Loved your answers! What great memories you're weaving for those children! I wish I'd had a teacher like you! PS - Yes, please share a pix of your pink pigtails! Oh I need to see a pic of you in pink pigtails!!! Hope you had a great Wednesday!! I just loved the Wednesday Medley this week! Cookies are my thing! Yes, I agree with Terri, we need to see your pink pigtails. I'm sure you have had a fun Wacky Wednesday. How did Wacky Wednesday go? I always loved seeing the kids come to school on theme days. The district I drove bus for had several times through the year that called for "wacky" dressing. My kids did the Dr. Seuss stuff last week! Your Wednesdays sound fun! Look forward to hearing what other things you have planned.